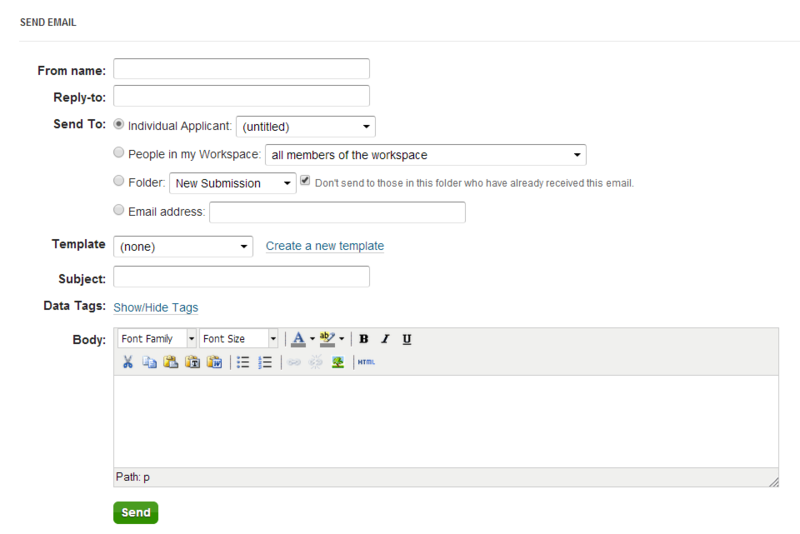 Actions: Send Email is used to send automated and customized emails. 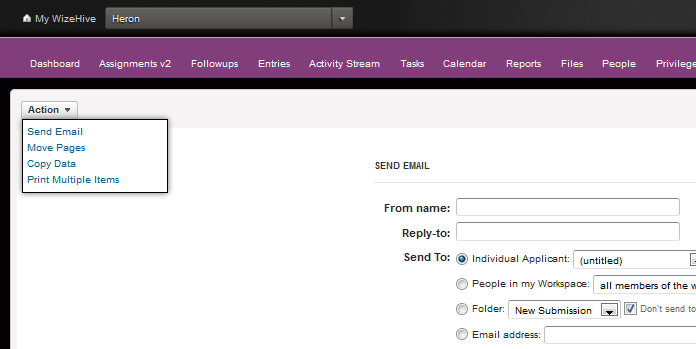 You may send emails by using the Actions tab. By default, the Send Email page loads when you click on the Actions tab, but if you move to another option in the Action screen, make sure to select the "send email" in the Action dropdown. For example: Send an email to all reviewers who have completed their reviews or all people that have an application assigned to them for review. For example, send a reminder email to all applicants that have their application in draft form. 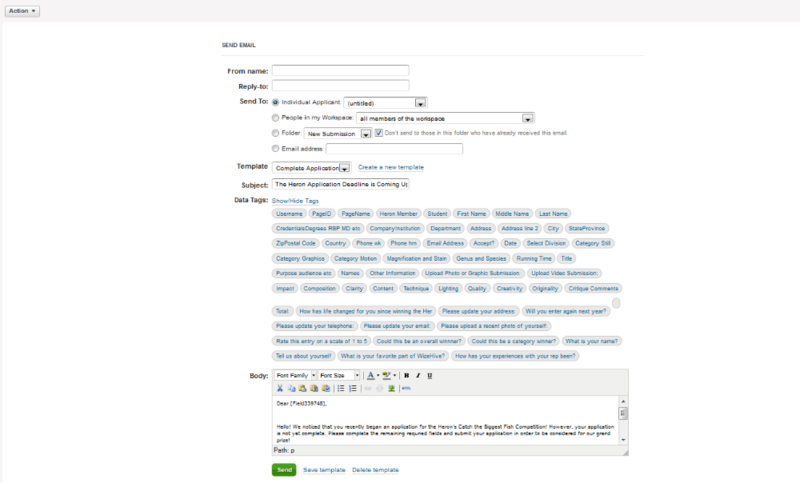 Template: Select the email template you would like to use. For more information see the Add a Template section of this document. The email address the email is going to be sent from is mailer@wizehive.com and this cannot be changed. We do this to ensure that emails will not go into recipients junk folders. 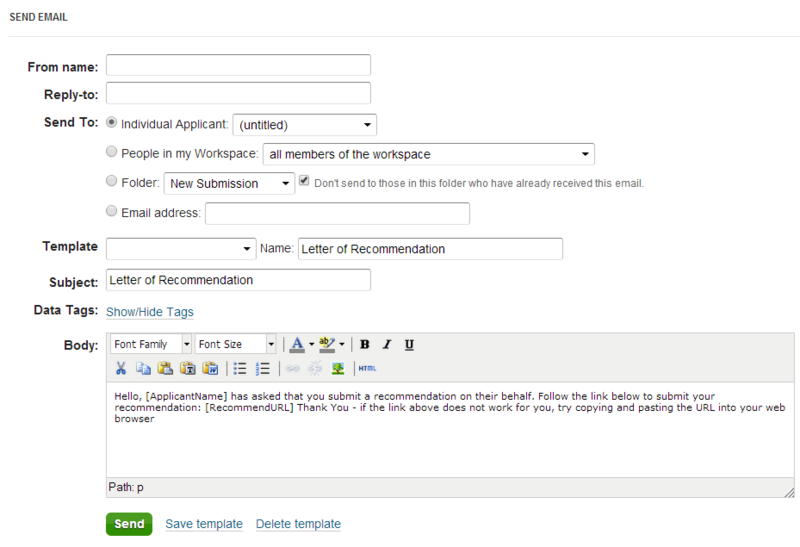 By setting the Reply-to email recipients will be able to reply to your desired email address. If you are emailing an applicant or a group of applicants, you may use Data Tags in the body of the email to insert information about the application related to each applicant. Click Show/Hide Tags to see the available data. If you move your mouse over a tag, you will see an associated [Field#]. If you click on it, the placeholder for that field will be inserted at the bottom of the email. It will look similar to this: [Field123456]. You cannot drag and drop the data-tag into the template. You can copy and paste that field anywhere you want the field to show. For example, in this email below we put in the placeholder for First Name. If this email was sent to John Smith, the email would begin, "Dear John." An email template is a great tool to use if you have to send out the same email multiple times. You can create the template and use it over and over. An example of when you might want to use an email template is to notify applicants that materials are due. If you want to create a template from scratch, click "Create a new template". Enter a name for this template. If you want to create a template based on a previously saved template, select that template in the dropdown box then change the name to a new name. When you save the template it will create a new template and leave the other one untouched. Enter the content in the Subject line and Body. If you are emailing an applicant or a group of applicants, you may use Data Tags in the Body to insert information about the application related to each applicant. When this email is sent to an applicant, it will display the data that they have entered for that field. Click Save Template. You will now see your created template in the Template Drop Down list. Select the template from the drop down list. Make the desired changes and click Save Template. A warning window will pop up to notify you that the changes will overwrite your previous email. Click OK. Select the template from the drop down list. Click Delete template. A warning window will pop up to make sure this is what you want to do. Click OK.